Left, Brittany Gilbert, 32, of Breckenridge, talks about being a two-time Flight For Life patient while flight nurse Maureen Maledon gives support at the dedication ceremony of the emergency transport service's new helicopter at its base at St. Anthony Summit Medical Center in Frisco on Tuesday, Oct. 7, 2014. 4: People can fit in the helicopter — one patient, one pilot and two medical personnel. 20: Flight time in minutes from Frisco to Denver, cut from 23 minutes. 22: Years of Flight For Life in Summit County. 140: Cruising speed in knots of the new helicopter, about 120 knots faster than its predecessor. 4,500: Weight in pounds of the new helicopter when loaded with a pilot, two medical care providers, a 200-pound patient and a half tank of gas. 120,000: Cost in dollars per month of leasing a B3e. 4 million: Cost in dollars of purchasing a B3. Brittany Gilbert wiped away tears before thanking the people who saved her life. The two-time Flight For Life patient was airlifted to Denver two years ago when a bike accident severely injured her brain. After a couple weeks in the hospital drifting in and out of consciousness, Gilbert said, the next thing she remembered was her husband telling her the doctors had discovered she was three weeks pregnant at the time of the bike crash. The Breckenridge resident made a miraculous recovery from the brain injury, but nine months later she found herself back in the Flight For Life helicopter. After a normal, healthy pregnancy, Gilbert experienced two seizures during labor. Doctors did an emergency C-section and again sent her up in the air. On Tuesday, Oct. 7, Gilbert brought her 1-year-old son, Leo, to the dedication ceremony for Flight For Life’s new helicopter at St. Anthony Summit Medical Center. The 32-year-old shared her story and then turned to flight nurse Maureen Maledon, who was on board the copter with her both times and who stood by her side Tuesday. About a dozen Flight For Life crew members lined the helicopter, and priest Michael Glenn circled the group, blessing the crew with holy water. Flight For Life Colorado operates out of Frisco, Denver, Colorado Springs, Pueblo and Durango as part of the emergency transport services of Centura Health. As the nation’s first medical air ambulance program, it has become the model for more than 300 air ambulance programs worldwide. The service’s five helicopters operate 24 hours a day, seven days a week with a service radius of about 120 miles from their bases. Each helicopter can carry a pilot, two medical care providers and one patient. 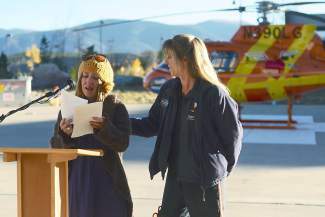 Flight For Life director Kathleen Mayer said the new helicopter in Summit has been in service since August and has already completed 50 flights, including transporting a baby born 13 weeks early, a 40-year-old hunter injured from a fall and a 70-year-old stroke patient. The helicopter, referred to as the B3e, was the result of a two-year fundraising effort and would cost about $4 million to purchase new. Mayer said Flight For Life leases the aircraft for $120,000 a month, or $1.44 million a year, from Air Methods Corp. in Engelwood, which employs Flight For Life’s pilots and mechanics. The helicopter that was replaced, a B3, could have continued serving Summit, Mayer said, but the B3e was chosen as an upgrade for its enhanced capabilities at high altitudes. “When people see it they will say, ‘Oh, it’s the same helicopter,’” said Rod Balak, Flight For Life’s program aviation manager. The biggest difference between the B3 and the B3e, he said, is a more powerful engine, which the new helicopter has demonstrated by hovering above 13,200-foot Argentine Pass and the 13,700-foot saddle between Grays and Torreys. “That’s huge,” said Balak, who was one of the two original Flight For Life pilots in Summit County, back when the Summit Medical Center was where Summit Middle School is now near the Frisco Bay Marina. Mayer said Flight For Life had high expectations for the new helicopter, and it has exceeded them. The B3e, which Mayer expects to last 12 to 15 years, makes better use of fuel and can carry heavier loads than its predecessor. The helicopter also has been outfitted with the latest technology, including a $150,000 autopilot system that weighs 10 pounds, much lighter than older 30-pound systems. Perhaps most crucial in the minds of patients is the B3e’s increased speed. The B3 cruised around 120 knots, or 138 miles per hour, while the new helicopter cruises 20 knots faster, around 161 mph, Balak said. That cuts down a trip from Frisco to a patient in the Leadville area from 14 minutes to 11. “It’s like the difference between a Volkswagen and a Corvette,” he said. Flight For Life’s first B3e was placed in Frisco, the country’s highest altitude medical helicopter base, with the logic that if it performs well here it will perform well anywhere. “This is normally the proving grounds,” Balak said. Though the helicopter’s transports have slowed down in the shoulder season, airlifts will pick up again once ski season starts. Balak said the summer months of June, July and August are generally when the helicopter makes the most trips because more people are in remote, backcountry areas. “It’s a lot during ski season, don’t get me wrong,” he said, but Labor Day is when the pilots, nurses, paramedics and mechanics say, “Oh my god, we made it” and take a deep breath. During busy seasons when more than one person needs transport, Flight For Life calls on its other helicopters to help out, and when the copter is grounded for snowy conditions, crews use ground transport through a partnership with the Summit County Ambulance Service.